The increasing use of smartphones is having a huge impact on local business. Nine out of ten mobile users now search for nearby businesses and 75% of them make a purchase as a result. Companies whose websites rank highly in local search results are reaping the benefits of this. 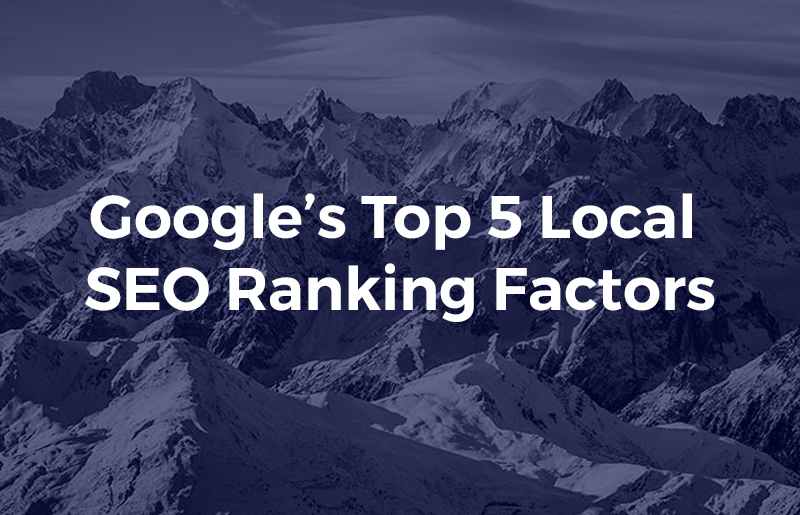 To make sure you don’t miss out, this post will look at Google’s top five local SEO ranking factors and show you how to optimise your site for them. The single most important factor in ranking highly in a local search is your business’ proximity to where a search is made. The nearer you are, the higher you are likely to rank. The way search engines know your proximity is through finding your name, address and phone number (NAP). Making sure that these three pieces of information are highly visible on your website, social media profiles and on other external listings is crucial, therefore, to ranking well in local search results. To make sure your NAP visibility is achieved effectively, make sure your NAP is displayed consistently everywhere. Always write exactly the same name, address and phone number. This way, every time Google indexes your NAP, it will associate it with the same company. Using two different addresses (e.g. with and without the postcode), may cause confusion. The second most important local SEO ranking factor is the information on your Google My Business page – your business category, your product or service keywords and your location. If you don’t have a Google My Business account, it is essential that you sign up for one and verify that account. As you can see from the image above, this is also how you get featured in results when someone searches for your business by name. The number and diversity of quality backlinks pointing to your website is another important local ranking factor for Google. Quality backlinks are an indication that other sites, which have good reputations themselves, find your website valuable. This value is what helps Google decide whether your site is worth ranking highly. Ideally, you want links from high-authority websites that are relevant to your location or area of business, for example, a local newspaper website, an industry blog, or a high-profile business directory, such as Yell. All these can have a very positive impact on your ability to rank well. What Google particularly takes notice of with local searches, is the quality of the backlinks that point to the website page you have listed on your Google My Business profile. So, if you have listed your homepage, you want to get as many good links to your homepage as possible. The key factor with backlinks is that they are quality links. Do not be tempted into putting links to your business in blog comments, forum posts or posting them on dubious business directories. This can be perceived by Google as breaking their webmaster guidelines and can result in a Google penalty. If in doubt, always seek advice from an SEO expert. Google’s main priority is to offer its users high-quality results. So, if someone searches for a local builder, for example, it serves that user best by showing them the best local builders. The way it finds these is by taking online reviews into account. Independent customer reviews and ratings are, therefore, crucial in helping you to rank highly. 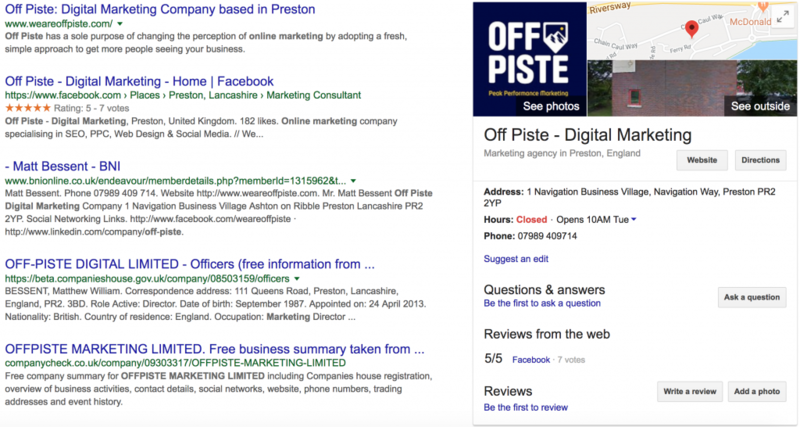 These include reviews on Facebook and sites like TrustPilot but, most important of all, are those on Google My Business. Of course, those reviews need to be good ones. Google is not going to recommend you if you have an average star rating of one. Encouraging customers to give reviews is important in helping you succeed in this area. Another indication that your business is highly-regarded by others is the number of likes, shares, retweets, etc., that your posts get on social media. Google takes these into consideration in much the same way as it does customer reviews. If your company has a positive reputation on social media, it is a key indication to Google that you are worth recommending to their users and this can improve your ranking. To build a positive social media reputation for your brand, you’ll need to create profiles and pages on the various social media platforms. Precisely which platforms you choose depends upon the nature of your business. If you don’t have the in-house expertise to run social media campaigns, you can always use a social media marketing specialist who can create the content needed to encourage users to follow your business and to like and share your posts. Achieving higher rankings for local searches requires a different set of techniques than trying to rank highly for general searches. The focus is very much on establishing your business within its location, using NAP. Ensure that your business has a good reputation using backlinks, customer reviews and social media. In addition, get on the right side of Google by registering with Google My Business and posting on Google+ can also be very beneficial. If you are looking for assistance with local SEO or developing your social media profiles, get in touch. We’ll be happy to help.